When he came to power, David Cameron promised to create the “greenest government ever”. Stop Climate Chaos – a coalition of the UK’s leading charities including Oxfam, Greenpeace and WWF-UK – wanted to make sure he did. Stop Climate Chaos approached us looking for a campaign that communicated to Cameron and the rest of the Cabinet the powerful economic argument for sticking to their green commitments. While most know the many environmental benefits of greener business, the economic benefits are less well known. 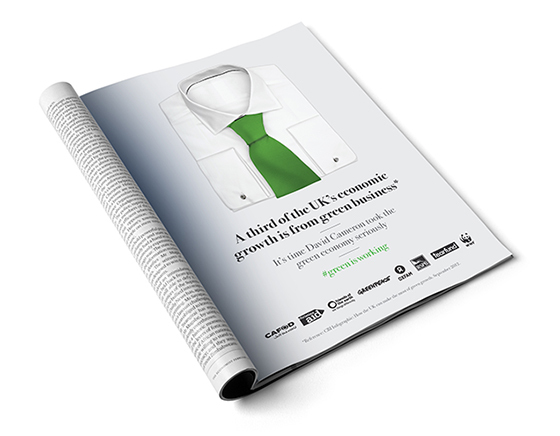 Yet over a third of the UK’s economic growth last year came from green business. Green business means business – and they wanted the PM to take note of this. The campaign needed to coincide with one of the key political dates of the year – October, when MPs were returning to Westminster from the Conservative party conference and were about to vote on the Energy Bill. 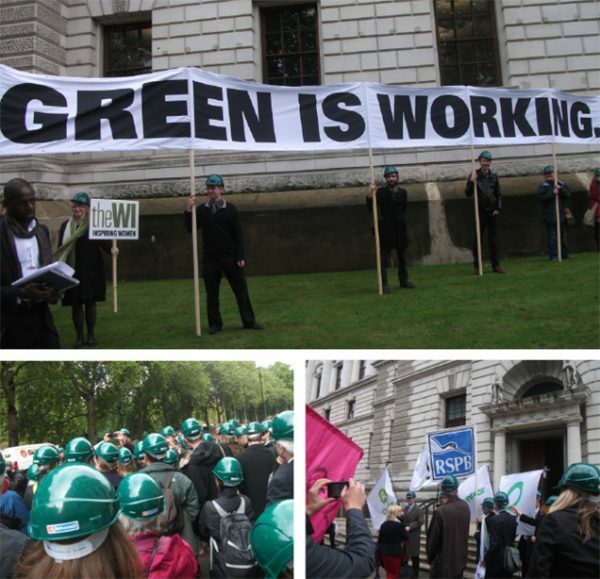 SCC already had a stunt planned – a queue of workers in green hard hats designed to pastiche the famous Conservative Party ‘Labour Isn’t Working’ poster of the 1970s. We needed a print campaign to coincide with the stunt. As is often the case with campaigning organisations, the deadline was pretty tight. Media space had been bought at some of the London’s busiest tube stations, including Westminster and St James. We had ten days from taking the brief to posters going up. A tight deadline can sometimes produce the best creative. You don’t have time to over-think it, you just have to get on with it. 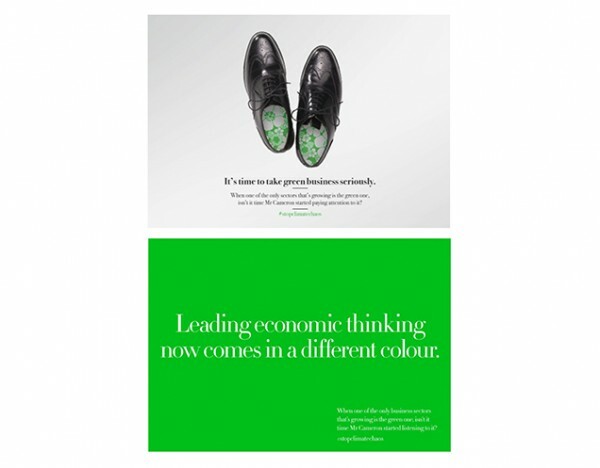 We came up with a number of different ideas, our favourite of which was a spoof of the famous Economist ads campaign of the 2000s (though with the iconic red replaced with green, naturally) – an idea that was probably a bit too clever and too much of an advertising creative in-joke, on reflection. The eventual creative was a bit more straightforward and perhaps all the better for it. 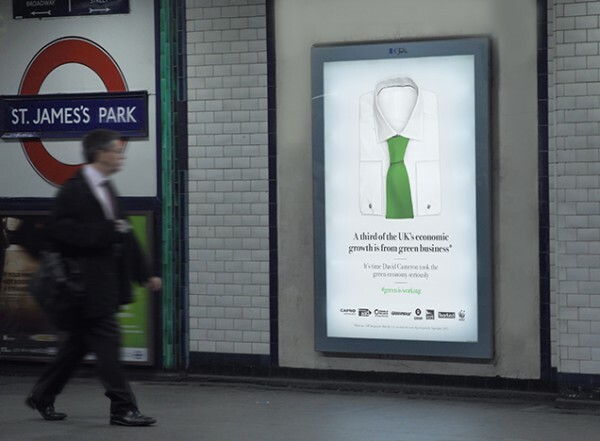 A clean, simple poster campaign that took traditional business items – a tie, a briefcase – and turned them green. Maybe a bit obvious, but sometimes obvious is what’s needed. Copy was similarly to the point. We were happy with it. We’d met the deadline with some room to breathe, and managed to get a collective sign-off from a coalition of some of the UK’s leading charities, all with their own different and strong opinions. No small feat in itself. The campaign itself did ok. It got people talking, it trended on Twitter, it looked decent. Did it work? It’s hard to say. As is often the case in the somewhat slippery world of Government, the Energy Bill was postponed, then tweaked, then voted through in a slightly different form. It’s not really a satisfying result. You want to be able to tie things up neatly and say – yes, this worked, we changed this. But you learn that the world of campaigning just isn’t neat. It’s small victories followed by small defeats. It’s perhaps conceding defeat in a battle but ultimately, maybe, winning the war. The lobbying bill (or 'gagging law') limits the activities of campaigning organisations for the year leading up to a general.